Thriving in sunny moderate climates, the cumin plant is a native of the Nile valley, Egypt and the Eastern Mediterranean. Today you'll find the spice being cultivated throughout the world, ranging from the Americas to Iran and Turkey, through to India, China and North Africa. A member of the parsley family (apiaceae), cumin (Cuminum cyminum) is a smallish herbaceous annual plant which grows to a height of approx 1 ft (30 cm). The weed-like branches and leaves of the plant are very thin and feathery and the flowers are a small, pretty pink or white colour. 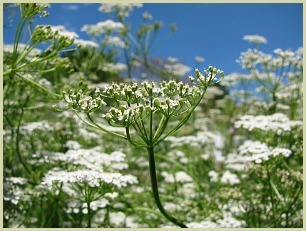 And it's these short-lived flowers that after flowering produce clusters of the popular cumin seed. Throughout its history, and still to this day, this spice is harvested by hand which takes place about 4 months after sowing. When the plants begin to wither and the seeds are yellowish in colour the plants are cut down and thrashed in the same way as they've been done for thousands of years. Read more on the history of cumin. They are then left to dry in the sun where they turn to a greeny brown colour and are ready for your cooking pot and numerous spice blends. These plants thrive in well-draining soil in a sheltered sunny spot. Note: I've never tried to grow black cumin, but as it also belongs to the apiaceae family, I guess it would need similar conditions to the above. Click for info on the black seeds and plant.